The latest notoriously bad behavior by the TSA has quickly become the biggest hot-button topic in America. 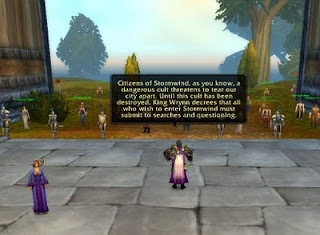 In a clear dig against the TSA and their latest invasive search procedures, the folks over at Blizzard Entertainment have created a scenario in World of Warcraft where players conduct searches of NPCs at the gates of capital cities while the inside of the cities themselves are filled with dozens of obvious cultists. 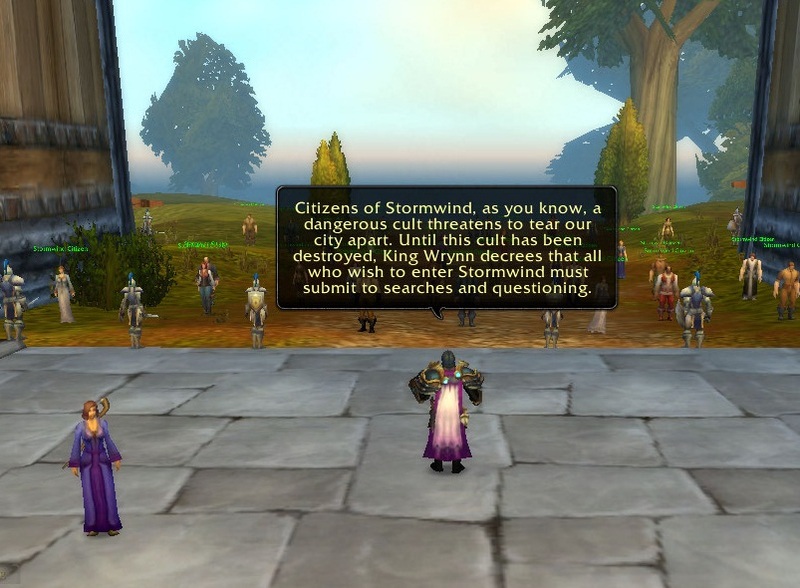 One of the strengths of any good MMORPG is the ability to integrate topical content in a fun and meaningful way and this is just what World of Warcraft has done with the "Show Me Your Papers" quest. Although I personally see it as a dig against the TSA and their new procedures, the content is vague enough, I believe, that the quest line could be seen as a show of support for the TSA. After all, a grave new threat has risen to threaten the security of the capital cities and the searches that the player conducts does uncover valuable evidence against the cultists and furthers the quest line along. Plus, the good guys win in the end. That's what so great about this particular political reference: it can be taken either way. Personally, I would have found it even funnier if the fine folks over at Blizzard had added "Don't touch my junk!" to the NPCs' repository of reactions to being searched. And, although it's a tad risque, it might have been fun to have a character, while searching an NPC, automatically utter "Is that a dagger in your pocket or are you just happy to see me?"